One of the tenets of the American Dream has been that the younger generation will be better off than the previous one. Spectrem Group research finds that not many Defined Contribution plan participants believe this will come to be. Only 24 percent believe that their children will be better off when they reach their parent’s current age. Just over one-third (35 percent) report that their children spend more than they did when the participant was their age. Less than half (41 percent) believes that their adult children are better at investing than they are. DC plan participants are saving not only for their own retirement, but to help ensure a secure financial future for their children. Spectrem Group’s DC Participant Insight Series report, Financial Behaviors and the Investor’s Mindset, which surveyed 1,442 participants in an employer-sponsored retirement savings plan, finds that the largest percentage (63 percent) of surveyed plan participants indicate a focus on maintaining their current financial position. 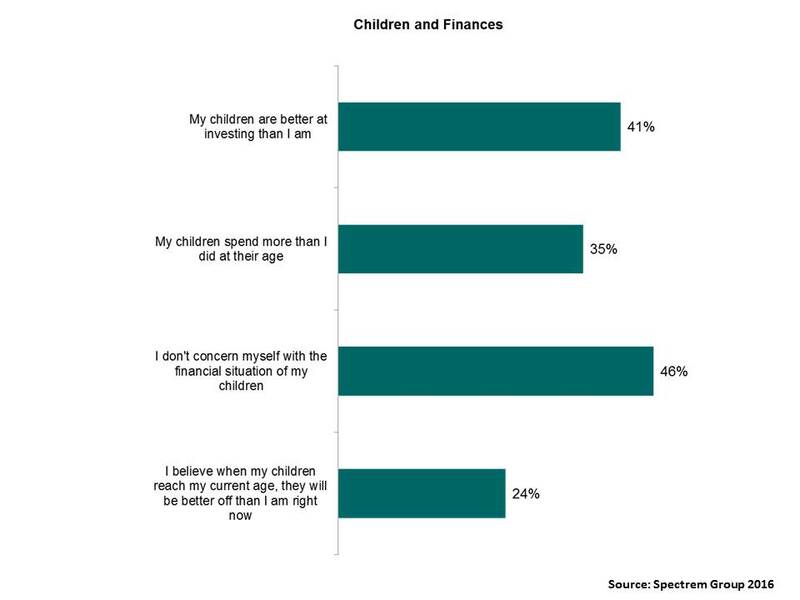 Almost half (45 percent) are concerned about the financial situation of their children. Do they have cause? DC participants with a plan balance of at least $750,000 are generally more likely than participants with lesser balances to predict that their children will be better off when they reach the participant’s current age. They are also more likely to give credit to their children’s investment acumen, which they profess is better than their own. But you know who else has high expectations for their children’s financial future: Plan participants with the lowest plan balances. Roughly half (49 percent) of participants with a plan balance of less than $10,000 report their children are better at investing than they are. That is on par with participants with the highest plan balances (46 percent). Participants with a plan balance of $10,000-$49,999 are more likely than participants with the highest plan balances to say their children will be better off when they reach the participant’s current age (38 percent vs. 31 percent). The “money talk” between parent and child is essential to helping to ensure that the American Dream is realized, and advisors can help to facilitate it. Almost half of DC plan participants (45 percent) profess not to concern themselves with their children’s financial future. While this might be because they feel they have their children’s financial situation well in hand, it might also be because they are willing to put the sensitive topic off for another day. Advisors must impress upon individuals that it is never too early to initiate a conversation about responsible money behavior. Poor money habits and attitudes not only threaten their children’s financial future, but also their parents, who might be called upon to help them. Meet the family. Advisors should offer to meet the plan participants’ family, including children and spouse. A financial plan is only effective if everyone is on board and working in consort with each other. Assist with investment education. An individual’s lack of confidence in their investment knowledge is an opportunity for the advisor to demonstrate their expertise and assist with advice and information. Ask what are the personal financial issues about which they are most concerned and provide them with reference materials or direct them to appropriate articles or blogs on those topics that are on your website. Such conversations are excellent relationship-builders.